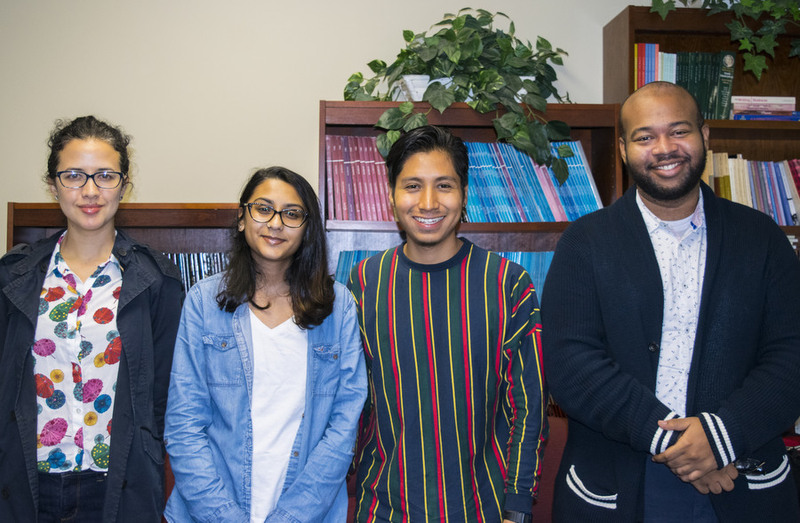 Four of CCNY’s six 2018 Mellon Mays Fellows from left: Fiorella Garrido-Lecca, Kiran Baldeo, Abraham Arriaga and Kendrick Zapata. Fiorella Garrido-Lecca spent part of the summer in her native Peru researching gender-based violence and how women resist it. At UCLA, her fellow City College of New York sociology major in the Colin Powell School for Civic and Global Leadership, Abraham Arriaga, explored the phenomenon of pet ownership by a subgroup of the homeless population. The two juniors are members of the latest cohort of Mellon Mays Fellows at City College. Six CCNY students have been awarded 2018 fellowships in the national program that paves the way to doctoral careers for students from traditionally underrepresented groups and others with a demonstrated commitment to the goals of MMUF. Isabel Estrada, program director at CCNY, is proud of the progress of their research since they were selected last spring. Since 2001, support from the Andrew W. Mellon Foundation is credited for guiding more than a dozen talented CCNY graduates to PhDs in the humanities and social sciences. There are now more than 17 Mellon Mays Fellows from CCNY in the pipeline, thanks to approximately $2 million in funding to date from the Mellon Foundation. The son of Mexican immigrants, Arriaga spent six weeks at UCLA. He looked at how animal companions diminish their homeless owners’ feeling of otherness, act as barriers and provide a sense of home and family outside of socially constructed understandings. A history major, Baldeo’s study of Guyanese identity focuses on why Guyanese of Indian descent and East Indians are perceived as one in the U.S. The junior is studying their respective migration histories to see how it’s shaped their different identities. The Colin Powell School undergraduate’s goal in studying gender-based violence and how women resist it is to contribute to the existing Peruvian literature on the topic in order to increase the resources available for women and the community. Another Colin Powell School student, Huaylinos’ concentration is anthropological archaeology. His current research focuses on the theory of the Anthropocene as a framework for investigating and analyzing long-term effects of human modifications to river systems and coastal regions once inhabited by indigenous peoples. A CUNY Baccalaureate major with concentrations in Middle Eastern and French studies, Petiwala has been accepted into the Mellon Mays/University of Cape Town January Program. “Decolonizing the humanities and universities in Africa,” “the politics of identity,” and “urban spatial segregation,” are some of the program themes. Zapata is pursuing a combined BA/MA degree in history before working toward a PhD in American studies. He focuses his research on masculinity with emphasis on how masculinity in the 21st century is being transformed by feminism. He’s also exploring how toxic notions of manhood perpetuated by men contribute to male gun violence, suicide, and depression.